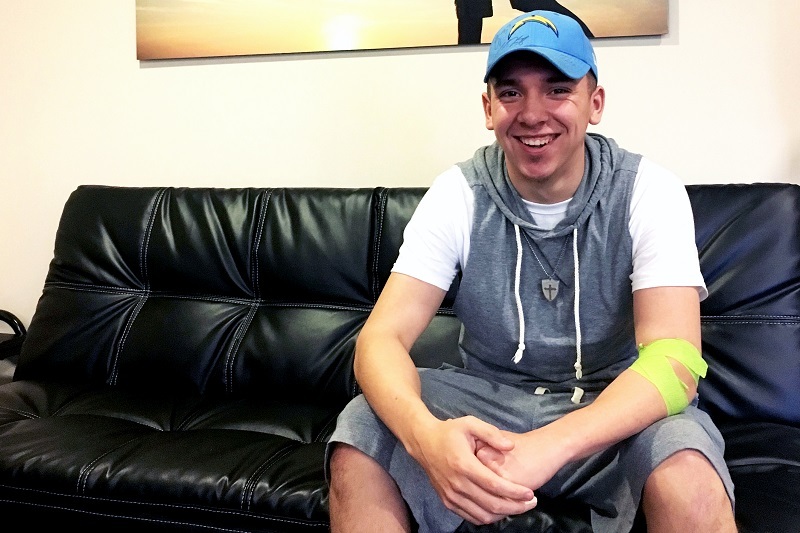 When 18-year-old Emilio Carranza-Davis heard the flu outbreak was lowering the national number of blood donations, he resolved to come in and give. This was his fifth time donating blood since his junior year of high school, and it’s something he tries to do as often as he can. Emilio was born and raised in San Diego. Some of the most important aspects of life for him are his faith in God, his time spent with family, and making a difference in this world, which he sees as especially necessary at this time. One of his favorite parts about donating blood is getting to read the stories of patients who receive blood from donors like him. Their stories are usually found in pamphlets or cards on tables in the canteen, the waiting area where donors sit and recharge after giving. The most impactful ones for Emilio are the stories about children in need.